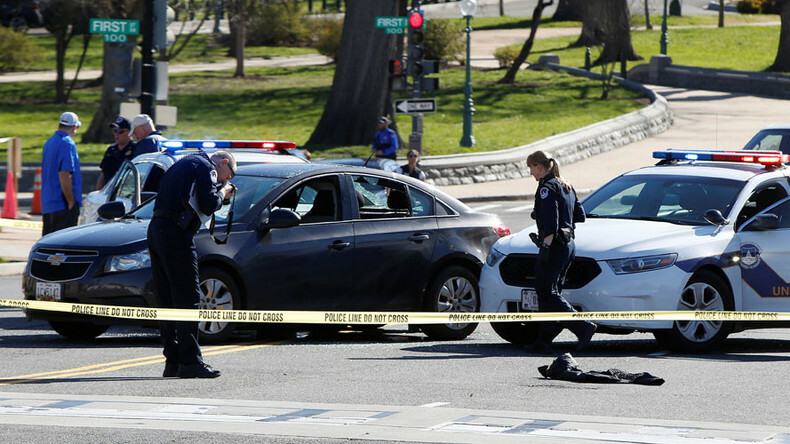 US Capitol Police have arrested a female motorist who hit a police cruiser and tried to run over several officers at a checkpoint on Capitol Hill in Washington, DC, local media reported. Several shots were fired but no one was injured. Multiple police cars have been spotted outside the US Botanic Garden, on the south side of the Capitol reflecting pool. A notice sent to area offices tells of unspecified Capitol Police activity at the intersection of Washington and Independence avenues, but the Capitol complex itself has not been locked down, according to one reporter from The Hill. Police have reportedly cleared civilians from the streets, and lawmakers have been told not to go outside. According to a reporter with WUSA-TV, the incident was an "officer-involved shooting" near the Botanic Garden. Metropolitan DC police told WTVD that a motorist had struck a Capitol Police cruiser and tried to run over several other officers, who were on foot. There were no injuries from gunfire, and the suspect has been taken into custody. A female driver was stopped by Capitol Police at a security checkpoint, but refused to follow instructions and rammed a cruiser, police said.